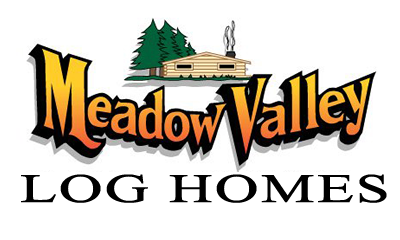 Meadow Valley Log Homes manufacturers its own logs and timbers from native Wisconsin Eastern White Pine. White Pine is noted for its strength, stability and beauty and is an ideal species for log home construction. White Pine is a renewable resource and our logs are a “green” choice in building materials. Once you’ve decided to build your log home, your first step is to create a floor plan. You may already have a plan in mind. You can start with one of our designs, replicate one you’ve seen in a magazine or create a custom plan of your own. Our sales team will help you solidify your ideas. Once you’ve settled on your design our sales team will create an initial log proposal, this proposal will give you an estimate of what your ideas will cost and allows you to modify your plans to suite your budget. Your consultation and log proposal are offered at no charge. After reviewing and accepting your log proposal a 10% deposit sets the construction wheels in motion to lock in your price. Next you’ll meet with our drafter to discuss the construction drawings for your home. From foundation to loft every detail that you envisioned will be made into floor plans and elevations. During this phase you may change your drawings to revise your home until it is perfect. When you are completely satisfied you will sign your prints. Our drafter will complete a row by row layout of your home to determine the exact amount of logs needed for your home. Then a contract will be prepared listing the final price of your home. Construction of your home begins with native white pine which is grown and harvested in central Wisconsin. The logs are first debarked and then cut into 10 by 10 timbers or cants. The cants are then placed in our yard to dry for a period of 4-6 months. While your foundation is being poured and back filled our production team will begin pulling the exact number of logs needed for your home from our inventory of drying cants. These logs are then milled at our production facility in Mather, Wisconsin. Our pendu machine mills the square timbers or cants into round logs, D or timber profiles. The logs are then sprayed with an anti-sap stain & sodium borate solution to protect them until staining. Based on a tally sheet from our drafter many of those logs will be notched for corners, loft joists or porch post logs. This is done prior to stacking the logs and preparing them for shipment to your jobsite. When the last log is milled your logs are loaded onto our truck for delivery. It’s important to have a good road and access into your building site and equipment for unloading your logs. Your log crew then begins by setting the logs on your subfloor following our row by row layout. They’ll erect an average size log home in 3 to 4 days. As the walls go up they will leave openings for windows and doors as specified on your construction drawings. When the walls are near completion they’ll construct the loft joists for your loft area. Once the logs are set, standard construction techniques take over to construct the gables and roof system, set windows and doors and complete your home. From start to finish your home will take 6 to 8 months for completion. Building your own log home and living in it is an extraordinary experience, one that you will enjoy for a lifetime. One you will be proud to share with your family and friends.